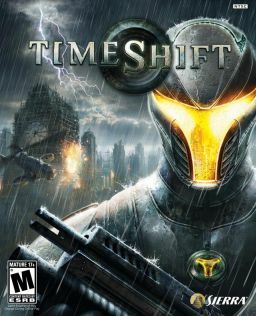 Timeshift cannot be run on integrated graphics. A possible fix through 3D Analyze is found here. Is currently using an outdated version of the game. See Patches. The Steam version is outdated and has certain unintended gameplay effects not seen on a fully patched retail copy. I.E. the protective helmets on green-armored enemies do not function correctly, as a result they die in one headshot from any weapon. See Patches for a fix. All available patches for the retail version can be found here. Patch 1.2 for the Steam release can be found here. Delete or rename saber_logo.bik, sierra_logo.bik and twimtbp.bik. 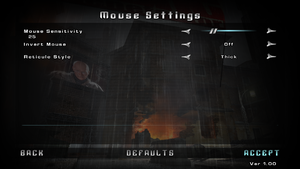 Menu and HUD elements are stretched. FMVs are in 16:9 resolution. 75-120° horizontal. See Field of view (FOV). 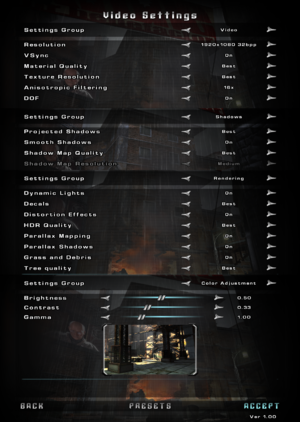 Change these values to the desired vertical FOV. At the top click on Edit, then Add. Enable Do not notify on task switch. Click OK, start the game normally. Set Antialiasing Compatibility to 0x004010C4. Set Antialiasing Transparency Supersampling to Sparse Grid Supersampling (same as previous value). 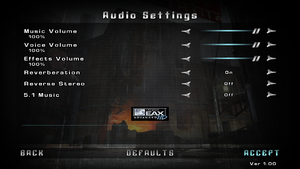 Options mentions 5.1 but it outputs up to 7.1. 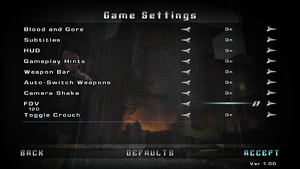 Right click on the TimeShift.exe file (located in <path-to-game>\bin) and select "Properties". Go to the "Compatibility" tab and enable Compatibility Mode (set it to "Windows XP (Service Pack 3)") and Run this program as an administrator. If the game still does not launch, disable Compatibility Mode and try again. Go to the "Compatibility" tab and enable Compatibility Mode (set it to "Windows Vista (Service Pack 2)"). There is currently no completely reliable fix beyond lowering graphics settings. 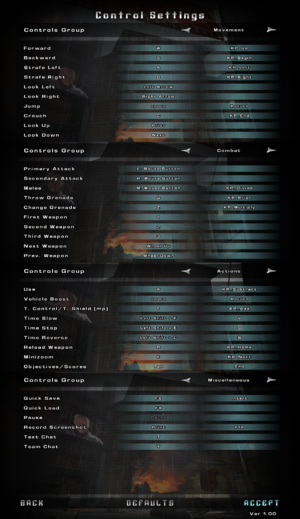 If game launches with black screen, disable all monitors other than the primary one in Windows, or just for the game by changing HRTF value in UserConfigs\Default\user.ini to 1 ("HRTF = 1"). ↑ 2.0 2.1 File/folder structure within this directory reflects the path(s) listed for Windows and/or Steam game data (use Wine regedit to access Windows registry paths). Games with Steam Cloud support may store data in ~/.steam/steam/userdata/<user-id>/10130/ in addition to or instead of this directory. The app ID (10130) may differ in some cases. Treat backslashes as forward slashes. See the glossary page for details.